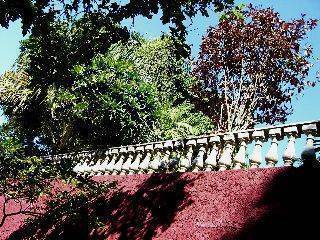 CASA AMARELO, a very exclusive mansion very well located in the artistic and charming district of Santa Teresa, close to the center of Rio de Janeiro. Recently modernized huge "Belle époque" style house from 1904, decorated by the French design agency Robert le héros, well known for its poetic and colorful stylish fabrics. The CASA AMARELO is a brand new guest house with an exotic Brazilian feel, combined with a unique and modern French touch. Experience a new way to stay in Rio de Janeiro ! 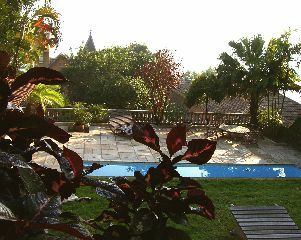 On the hill of Santa Teresa, close to its convent, CASA AMARELO is surrounded by old mansions and an extravagant tropical nature, right in the center of the city, overlooking the Rio's downtown and the bay of Guanabara. 5 minutes from the historical center (Convent of St. Antonio, historical churches, cultural center, opera house and museums). 3 minutes from Lapa, the heart of the samba bars and cabarets of the 20’s, the real night life in Rio: popular, sophisticated and underground at the same time. Five luxury vast suites, all with privative bathroom, from 30 to 60 m2. High ceiling reception hall and sitting rooms. Fantastic Art Deco varanda overlooking Rio's skycrapers and churches. Wireless internet is available in the entire property and is free of charge. A huge garden with extraordinary flowers, palm trees, mango trees. Exotic species are the natural home for little monkeys and parrots that you'll see relaxing in the garden ! 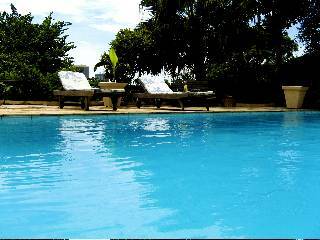 Enjoy the quiet solarium, surrounded by nature, in the swimming pool area, at the top of the garden, overlooking the city. Homey, spacious and alluring, CASA AMARELO mixes the charms of a colonial building with contemporary fixtures and facilities. Named by the fabrics designed by Robert le Héros ( Tivoli, Indigo, Fleur des Anges, Blossom and Grenadine) each of the 5 vast guest-rooms, ranging from 30 to 60 square meters, all with their own private bathroom, come into a subtle yet cheerful palette specially created to match antique furniture and pieces of Brazilian design from the 50’s and the 60’S. "Grenadine suite" Very nice and confortable double room (about 30 m2), close to the reception rooms. Kingsize bed. IPod sound system in the room. Celling fan. Dressing room. Old original Art Deco bathroom with shower and bath. Separate toilet Excellent mix of continental and Brasilian breakfast is served from 8h30 till 10h30 AM in the "Tropical Varanda", old stylish winter garden, with a spectacular view on the center of Rio. "Indigo suite" Large and very stylish double room (about 30 m2), with direct access to the reception rooms. Double bed. Possibly triple with an extra bed (add. charge) Celing fan WIFI access in the room. IPod sound system in the room. Dressing room. Small bathroom with shower and toilet Excellent mix of continental and Brasilian breakfast is served from 8h30 till 10h30 AM on the "Tropical Varanda", very old winter garden with a spectacular view on the center of Rio. 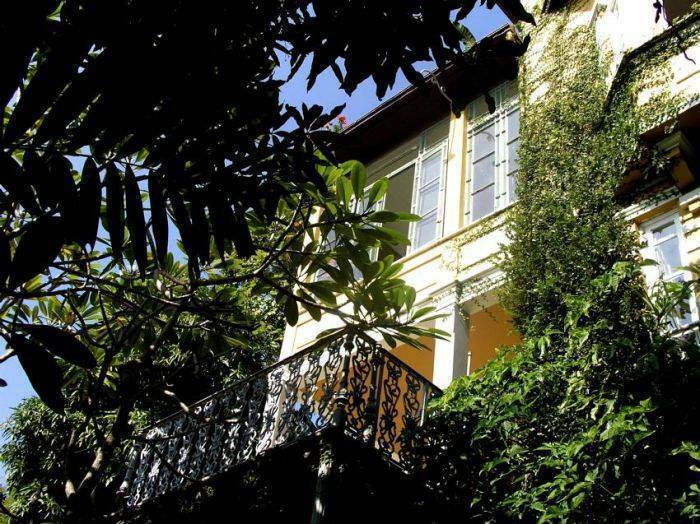 "Fleur des Anges suite" Very large suite (about 45 m2), with direct access to the garden. Possibly extra room for a family suite (additional charge). Kingsize bed. iPod sound system in the room. Dressing room. Very large bathroom with shower and separate toilet Excellent mix of continental and Brasilian breakfast is served from 8h30 till 10h30 AM on the "Centro terrace" privative terrace in front of the room, with a spectacular view on the center of Rio. "Blossom suite" Very large double room (about 50 m2), with direct access to the garden. King size bed, possibly twin (or triple room with an extra bed, additional charge) IPod sound system in the room. Dressing room Large bathroom with shower and toilet Excellent mix of continental and Brasilian breakfast is served from 8h30 till 10h30 AM on the "Orchideas terrace" in front of the room, close to the fountain. "Tivoli suite" Cosy and very romantic double room (about 30 m2), on the top of the house. Kingsize bed. IPod sound system in the room. Air conditionned Dressing room. Small very clear bathroom with shower and toilet Amazing view on the center of Rio Only access with elevator Excellent mix of continental and Brasilian breakfast is served from 8h30 till 10h30 AM in the "Tropical Varanda", old stylish winter garden, with a spectacular view on the center of Rio. Santa Teresa is an example of a real carioca village with the charm of its colonial and ecclectic architecture from the XIXth and early XXth century. Visit the famous carmelite covent and the small Chacara do Ceu museum, enjoy the fantastic view from the "Parque das ruinas" belvedere, taste the divine brazilian food at the restaurant aprazivel, dance all night at the bar do mineiro. The Lapa district is just down the hotel, listen to the classical Bossa Nova music played in the bars, dance with the great Samba rythmes in the numerous old houses or on the main square. Experience the Brazilian way of party ! Enjoy a real experience at 5 minutes walking from the hotel. 50 percent of the total amount will be charged on the day of booking and is refundable up to 1 month before check-in. The whole amount will be charged one month before arrival. The first night is non refundable for a cancelation between 30 and 15 days before check-in. The whole amount is non refundable for a cancelation less than 15 days before check-in. During New Year's Eve and Carnival period, the two first nights are non refundable for a cancelation between 30 and 15 days before check-in. Very well located and easy to find at the bottom of the hill of Santa Teresa. In the center of town, go to Lapa, cross the "Arcos da Lapa" till the av. Gomez Freire. Turn left till the end of this avenue. Take the Francisco Muratori street in front of you, going up to Santa Teresa. The first street with the tramway trails is the Joaquim Murtinho street. Casa Amarelo is at number 569 in this street. Bus lines 206 and 214 from "Castelo" in the center, and from "Central" the main railway station of Rio. The very old tramway called "Bonde" goes up from the center of town, very close from "Largo da Carioca" (metro station), pass the "arcos da Lapa" in the direction of Santa Teresa. 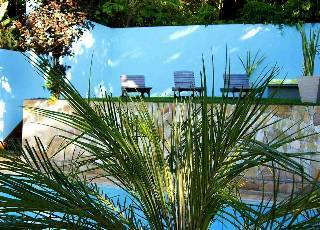 CASA AMARELO is situated at the third stop, between the Arcos and the Curvelo stop. 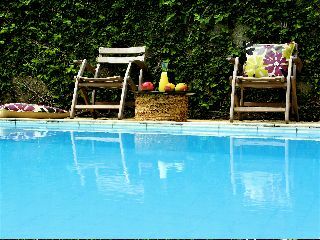 Nearest airport: 4 Km from the domestic flights central Santos Dumont Airport ; 20 Km from the Galeon International airport.